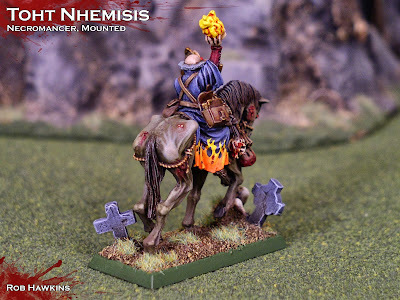 The first batch of models from my Vampire Counts painting queue are finished– I can now bring the full fury of 40 black knights to bear on the battlefield! 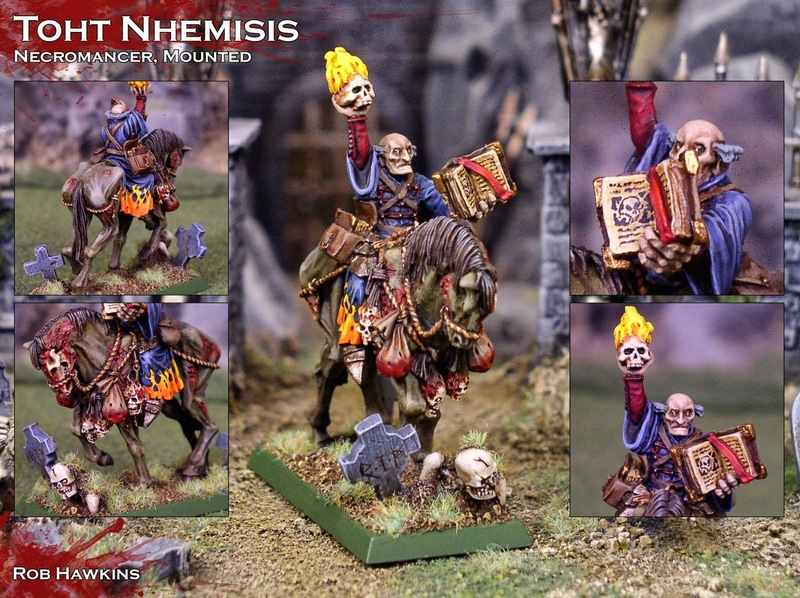 And the mounted necromancer is, at long last, complete. 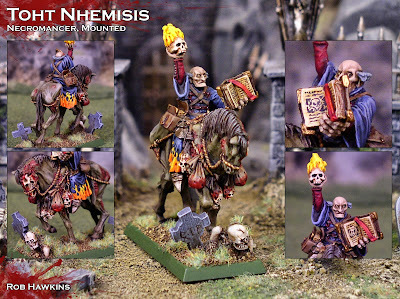 Not much is known about this elderly necromancer, other than that he hails from the South near the Khemrian empire. 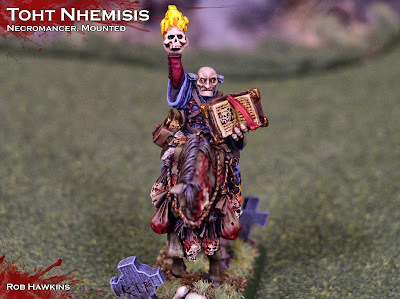 He joined the Legion of the Infernal Skull's ranks early during Nieman Kimmel's ascention to power, and has been a seemingly loyal servant to his dark master. When the Von Koss vampires wrested control of the Legion, and it appeared there would be a schism in the high command between the vampire family and those loyal to Kimmel, Toht Nhemisis chose neither side. Instead he swore fealty to the army itself, bound to honor the Infernal Skull, regardless of who carried the banner. I've never been a fan of the older "stock" necromancer models. The original version of Toht (on foot) is made from the Mordheim necromancer. 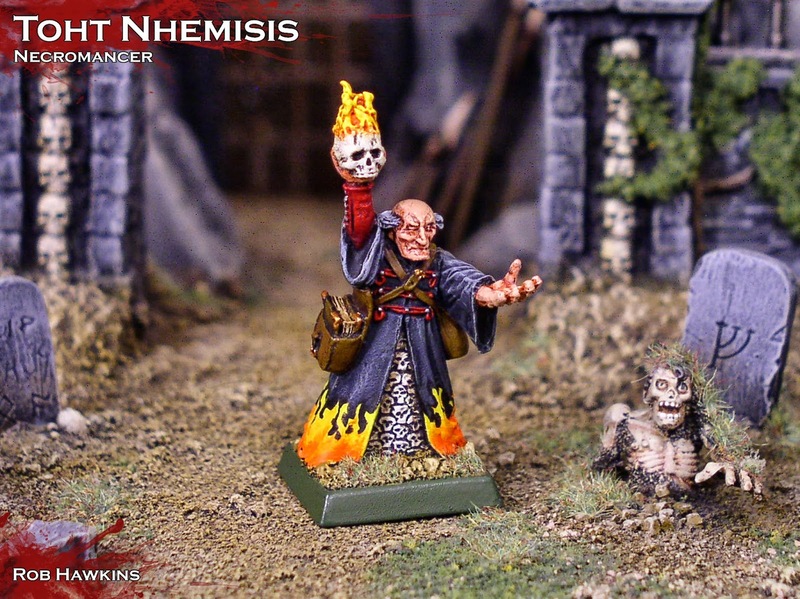 Flames were added to the skull with modeling putty, and the sword was replaced with a hand from a plastic zombie, posed as though he's summoning his minions from the earth. I've needed a mounted necromancer for a while, someone who could keep pace with the knights as they moved out on the flanks, or ahead of the main battle line. 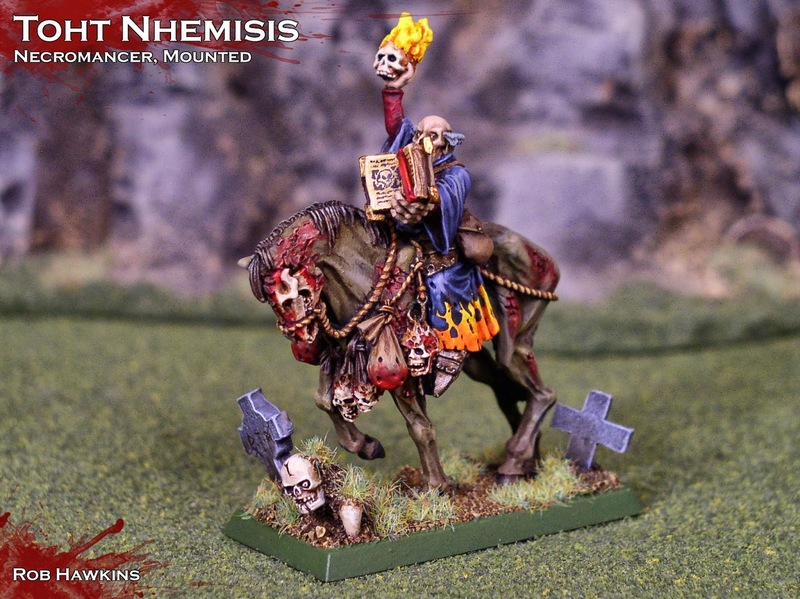 For this new version of Toht, I used the same Mordheim model, mounted on top of the Lord of Nurgle's zombified horse. 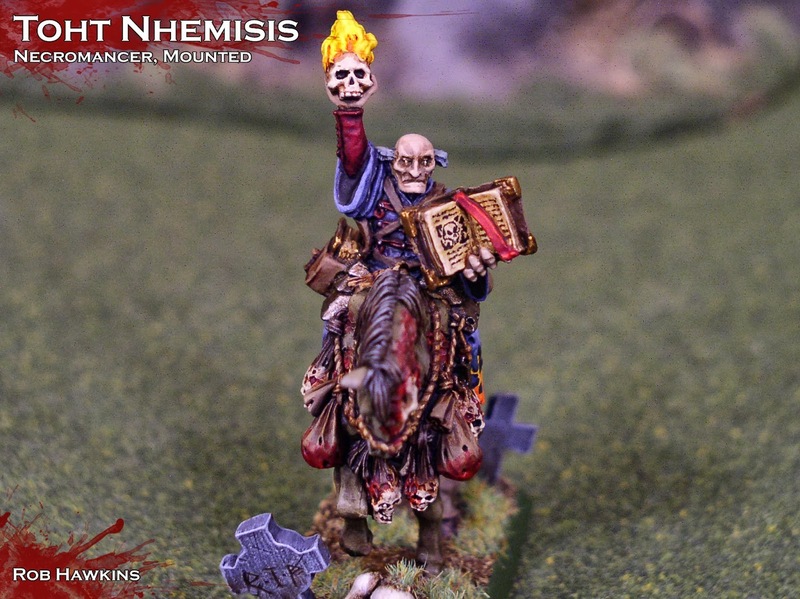 The book is from the Sisters of Battle Cannoness, held in a plastic zombie hand. Wow =) the freehands in the Book are amazing. Thank you for sharing the progress. The knights look intimidating. PS: I´m insanely jealous on your speed of output ! Great stuff, the flames looks really effective. Man, I love how you do the colors in the flames. Beautiful work.